Apple.com-scan.live is the potentially unwanted program, or in other words adware that causes system alerts stating about malware infection. Pre-determined scan results encourage to install rogue system tools and even cause automatic downloads. You need a trustworthy anti-malware to delete this PUP. Apple.com-scan.live scam is the version of Mac malware that targets various Apple devices with adware-type behavior and scary system messages. Apple.com-scan.live is the potentially unwanted program that shows in-browser messages claiming that the system is infected with viruses. However, this is not true, and these alerts are designed to deliver predetermined information about the malware infections to promote questionable optimization or security programs. This pop-up browser alert is a part of a scam that displays “DOWNLOAD REQUIRED” and “REMOVE VIRUSES NOW” messages to scare people into downloading the suggested software by clicking on those buttons. 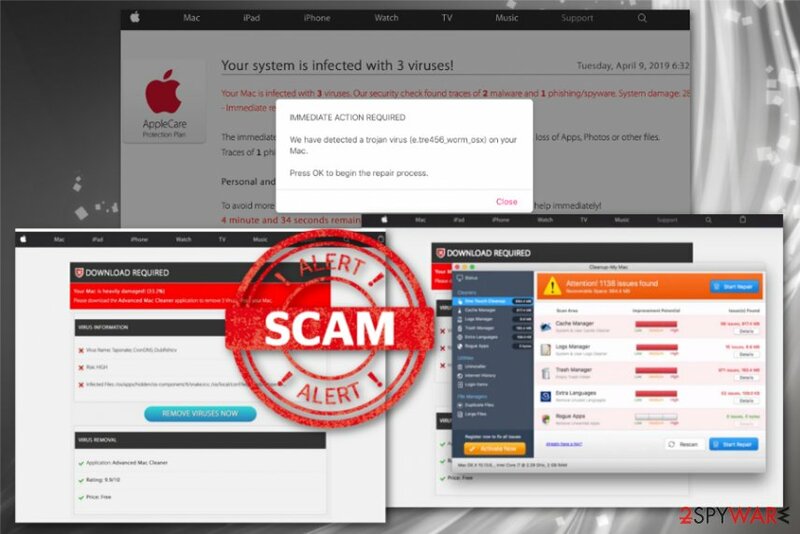 Message delivered by Apple.com-scan.live scam states that the system is infected or even damaged and to avoid any further harm, you need to download the promoted software. Unfortunately, dubious software like Cleanup-My Mac that gets installed in this campaign gives no value to your machine. Although many people think their MacOS device is immune to malware, Mac viruses are real threats. However, there is no need to have system optimizers or clean up tools, especially when these applications only deliver fake scan results. All this behavior regarding the system alerts and intrusive commercial content is caused by the PUP that got installed on your device without permission or knowledge. Apple.com-scan.live is the social engineering attack-based potentially unwanted program that affects your device and Safari, Google Chrome, Mozilla Firefox, or any other browsers with intrusive behaviors, commercial content and additionally installed programs. Please download the Cleanup-My Mac application to remove 3 Viruses from your Mac. Apple.com-scan.live promotes various system optimizers, but all of them are not giving any value for the system. Tools claim to detect malware, remove threats, clean junk files, manage applications and fix issues regarding the boot time. However, all those features are offered for the full licensed version of this program that should be purchased. Unfornutately, these rogue system tools have no useful features because the predetermined system scan results show false names of the malware. In most cases, Apple.com-scan.live adware is the only unwanted and intrusive program that affects your machine. Apple.com-scan.live is the potentially unwanted program that can be categorized as adware, because it focuses on redirecting the online traffic and delivering commercial material to generate views. Alerts and messages delivered by this intruder can even cause Apple.com-scan.live full-screen messages that keep you from exiting the window and tricks into pressing buttons what leads to redirects and different unwanted behavior. Unfortunately, frustration caused by this intrusive commercial content is not the only issue regarding those redirects or the redirects, pop-ups in general. Since Apple.com-scan.live is the adware-type program it associates many advertisers, sponsors, and commercial content creators. This is one of the more prominent potentially unwanted program symptoms. Malvertising means that all the content delivered on your screen has the purpose of creating views and generating revenue for the sponsor. You should remove Apple.com-scan.live as soon as you can because those details collected about you get used later on for creating personalized advertisements and fill up your screen with even more commercial material. Your browsing habits and things you are interested in allows advertisers to make sure that their promotional ads trick you into visiting the site or even purchasing their products. However, the more time on the computer you give for the PUP, the more additional alterations can be made. Make sure to get the reputable anti-malware tool and scan the machine fully. This is the best method for Apple.com-scan.live removal because programs like Reimage can check different parts of the computer for all the components of this PUP. Potentially unwanted programs like adware or browser hijackers come to the system with the help of software bundling or different deceptive techniques like intrusive ads and pages. Also, p2p services, torrent sites, or questionable content on social platforms can deliver this type of program on your machine. You should be very careful online because various pop-up ads and redirects may expose you to malicious content. However, paying attention is especially important when it comes to freeware installations and updating your software from less than reputable sources. Remember that this potentially unwanted program installs other tools and applications with or without your permission and knowledge, so remove Apple.com-scan.live using the automatic virus elimination method. This solution when you employ an anti-malware program for the job gives the advantage of terminating all possible threats. Automatic Apple.com-scan.live removal using anti-malware tools is advisable because this way any computer user with less experience can terminate this cyber threat completely form the machine and possibly fix the virus damage. Just make sure to choose the reputable source and tool. Wait until you see Applications folder and look for Apple.com-scan.live or any other suspicious programs on it. Now right click on every of such entries and select Move to Trash. Here, select Apple.com-scan.live and other questionable plugins. Click Remove to delete these entries. Now you will see Reset Firefox to its default state message with Reset Firefox button. Click this button for several times and complete Apple.com-scan.live removal. Here, select Apple.com-scan.live and other malicious plugins and select trash icon to delete these entries. Click Reset to confirm this action and complete Apple.com-scan.live removal. Here, select Extensions and look for Apple.com-scan.live or other suspicious entries. Click on the Uninstall button to get rid each of them. Now you will see a detailed dialog window filled with reset options. All of those options are usually checked, but you can specify which of them you want to reset. Click the Reset button to complete Apple.com-scan.live removal process. ^ Lily Hay Newman. Malware has a new way to hide on your Mac. Wired. Latest news. ^ Catalin Cimpanu. Malvertising campaign abuses Chrome for iOS bug to target iPhone users. ZDNet. Technology information news. This entry was posted on 2019-04-17 at 07:06 and is filed under Adware, Mac Viruses, Viruses. You can quickly scan the QR code with your mobile device and have Apple.com-scan.live manual removal instructions right in your pocket. How did you remove Apple.com-scan.live?